Heavy tetracycline staining maxillary and mandibullary arch. Full mouth rehabilitation was performed. 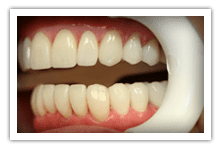 Posterior teeth (molars and premolars) were covered using all porcelain crowns and anterior teeth were covered with porcelain veneers. Severely broken down teeth and misaligned. Deep bite and cervical decay. Patient suffered traumatic injury to his face. Patient Danny Stillman, suffered a gunshot wound to his left side of his face, creating a large defect, missing alveolar bone and posterior teeth. 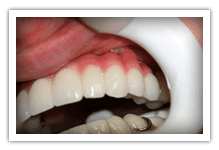 Full mouth rehabilitation has been performed using all porcelain crowns and 4 implant supported all porcelain obturator to replace missing alveolar bone and teeth on the left side. Severe periodontal disease maxillary and mandibullary arch. 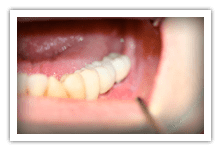 Patient 45 year old female, lost all her maxillary teeth as a result of periodontal desease.All upper teeth have been replaced by implants.14 implants have been placed, one for each missing tooth. 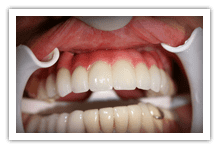 Pink porcelain was used to replace the missing soft tissue (gingiva). 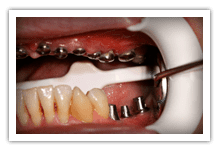 Lower 6 implants have been used, 3 on the left side and 3 on the right side. Lost maxillary anterior teeth, and the complete supporting bone structure. Patient 47 years old female lost her maxillary front teeth and bone as a result of a car accident. 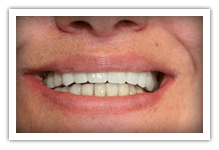 Several years she was wearing a partial denture(plate).Treatment consisted of placing 6 total implants,3 on the right side and 3 on the left side. A custom,precision,all porcelain obturator was made, retained by lingualy positioned gold screws. Her lip support, smile and function was restored. Chronic head ache symptoms with constant ringing in the ear, limited opening capability and constant clenching. 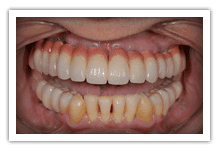 Complete all porcelain crowns and veneers have been used in this case to improve esthetics and function. Patient was suffering for years of headaches and ringing in her ears. Symptoms completely subsided after the case completion. 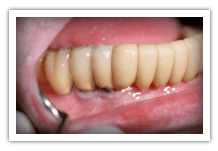 Severely atrophied mandible: Severely atrophied mandible was restored using six mandibullary implants and fixed porcelain bridgework.